When someone asks for ROI, what they really want to know is, why should I give you more budget and resources? Whether you’re helping to drive brand awareness and social engagement or crafting emails and job postings, recruitment marketing is very much a part of your job in talent acquisition. And, just like talent analytics show the value of recruiting activities, you need to know how to show the value of your recruitment marketing activities. 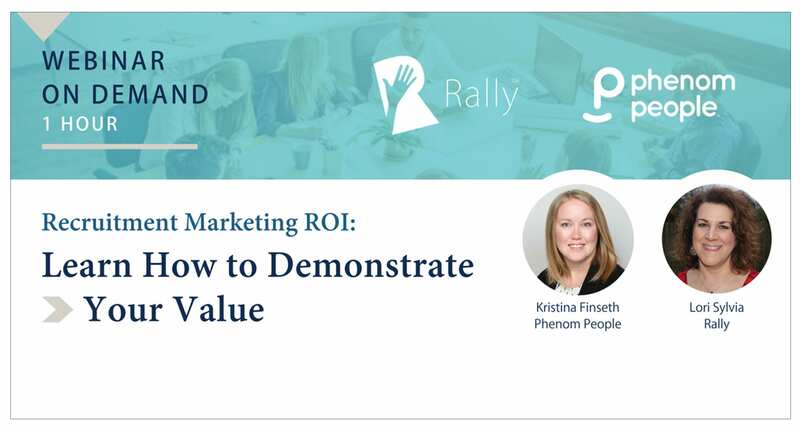 Kristina Finseth is a content Content Marketing Lead at PhenomPeople, the pioneer of the world’s first Talent Relationship Marketing Platform, where companies attract phenomenal talent (no pun intended) through a hyper-personalized digital experience. Lori Sylvia is the Founder and CEO of Rally™ Recruitment Marketing, an online community forum where the best Recruitment Marketing ideas are learned and shared to help HR, Recruiting and Marketing professionals gain new skills, advance their careers and deliver greater business impact.